Energy Observer, which uses on-board solar and wind power to desalinate and electrolyse seawater to make hydrogen for its hydrogen fuel cell power system. Ships are responsible for a lot of global pollution. Small gains in efficiency have been more than offset by the increased volume of trade. Historically most environmentalists argued that relocalizing the economy and decreasing trade was the best way forward, but there is little evidence that this is about to happen any time soon. Another path is to make shipping very much less polluting. Currently most shipping uses diesel engines burning a particularly polluting form of fuel oil known as bunker oil. A range of exciting technical innovations are pointing to the possibilities of a future with global trade based on pollution free ships. In 2013 I blogged about the MS Turanor making the first circumnavigation of the globe using just photovoltaics and batteries and I’ve frequently blogged about hydrogen fuel cars, trucks and trams. Today I want to focus on two hydrogen powered boats that I think have tremendous potential. In April 2016 Cheetah Marine successfully launched a catamaran powered by an outboard motor using hydrogen in an internal combustion engine. Cheetah are based at Ventnor in the Isle of Wight where they make hydrogen using energy from the solar panels on their workshop roof to split ordinary mains water into oxygen and hydrogen using ITM’s electrolysis process. The hydrogen is stored in pressurized tanks on the boat. The Energy Observer is a French boat currently being completed ready for its official launch this May in Paris. Again it is a catamaran but in this case using hydrogen fuel cells. 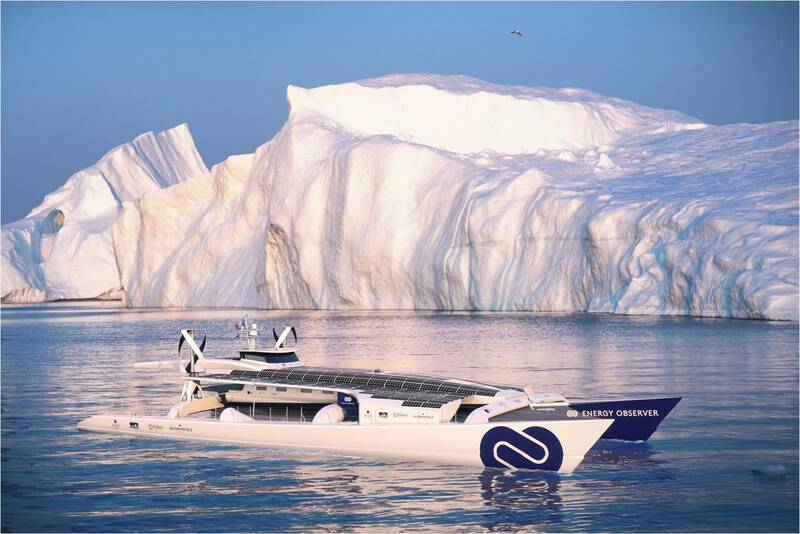 Seawater will be purified and pass through an electrolysis process onboard the boat utilizing energy from onboard solar panels, two small vertical axis wind turbines and a traction kite. A six year round the world trip is planned calling in at 101 ports as an educational showcase for clean technology. These two hydrogen powered boats, along with MS Turanor, show the technological potential for shipping to become radically more sustainable. What is needed at this stage is strong action on pollution through outright bans, taxes and other disincentives, and support to take these innovative cleantech solutions out into the mass market. Last month I blogged about how electric buses, many with solar panels on the roof, have suddenly leapt from the eco-fringes to the commercial mainstream in some Chinese cities such as Shenzhen. How long will it be before clean renewable hydrogen replaces dirty bunker oil as the main energy source powering the global shipping industry? Much of the best innovation is happening in Britain and France, yet will it be China that takes it into mass commercial production? We need to stop pollution and replace it with very much cleaner technology, and there are huge economic and health opportunities to be gained by doing so. To grab these opportunities requires political support. It is about time Britain and Europe turned this native innovation into the norm for mainstream commercial shipping. If they don’t somebody else will. Bunker oil has had its day. Better technologies are available. Now is the time to develop and deploy them. This entry was posted in Environmental, Global, Transport on 13 March 2017 by Richard.